Need a sweet to share with a group? 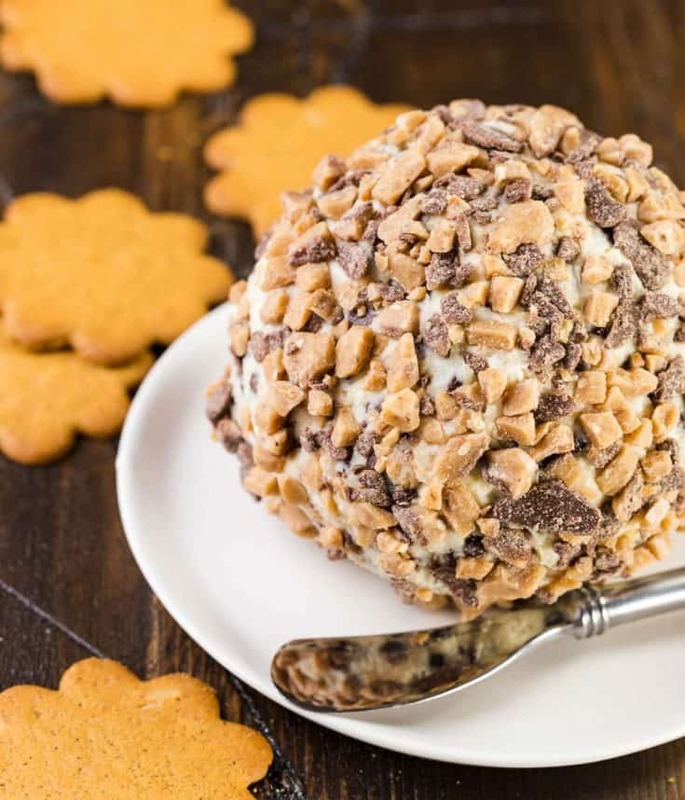 This Chocolate Chip Cheese Ball is the perfect dessert for any gathering made with pantry staples. The holidays are near and the social season is gearing up. Just when you didn’t think it was possible, life got busier. And that’s why you need this Chocolate Chip Cheese Ball in your life. Easy, delicious and the hit of every party. There will be many times over the next few months when you need to bring a dish to share at a party. It’s fun to do, but sometimes it creeps up on you. Suddenly it’s party day and you totally forgot. Or you had planned on making this great dessert but didn’t have time. 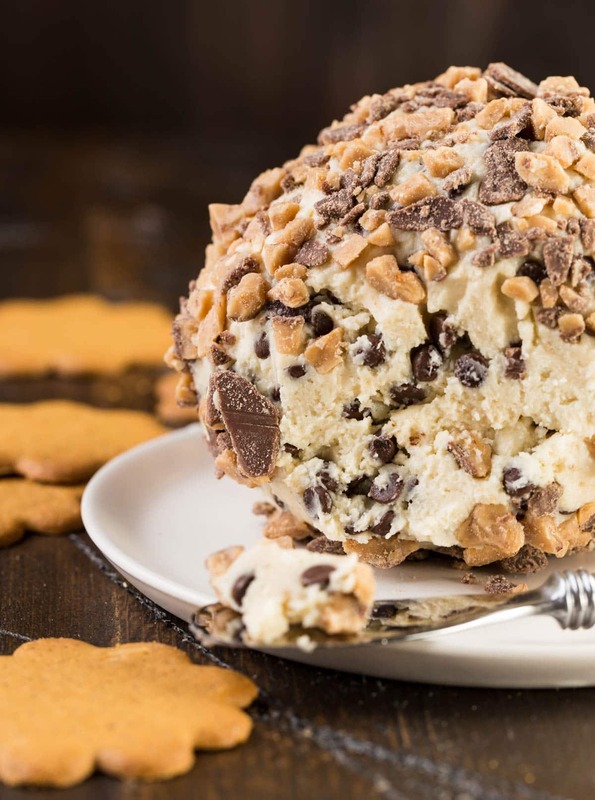 Let your stress melt away because the answer is here: the Chocolate Chip Cheese Ball. What? A sweet cheese ball? Yes! This dessert will make you the hit of the party. It tastes like a fluffy cheesecake filled with mini chocolate chips, coated with toffee bits, and you use a cookie to scoop up all the goodness. Can it get any better? Friends will smile when they see you walk in with it. Your family will ask for it by name. Because it is just that good. And that easy. And you probably have everything you need to make it in your kitchen. If you don’t now, you will soon. Trust me. Make-ahead Tip: This cheese ball freezes well but wait to coat it in toffee bits until right before serving. Beat cream cheese, butter and vanilla until fluffy. Add sugars and beat until just combined. Stir in chips. Cover and refrigerate for 2 hours. Shape into a ball on Saran wrap and chill for 1 hour. Roll in toffee bits or chopped pecans just before serving. Just a quick note, Nabisco isn’t baking their Famous chocolate wafers anymore, according to the friendly fella at Cub…. Jen, I just bought them last week at my Cub in Eagan. I’ll check when I am there this afternoon. Thanks for the heads up! Yummy recipe! Made it for some guests this weekend (without pecans due to nut allergy) and it was a hit! Thanks, Donelle! Sometimes I roll it in toffee bits too. Equally delish!